For Kristin & Dane's Wedding, this past Saturday at The Langham Hotel in Pasadena, spring was the perfect thing for their perfect spring wedding. The sun was shining on this beautiful day, and all the flowers for the wedding were blooming for springtime. The color combination for the wedding included ivory, champagne, and green tones. The bride carried a beautiful and classic bouquet of all ivory roses, while her bridesmaids each carried a bouquet of champagne sahara roses, green hydrangea, green viburnum, and ivory vendella roses. The centerpieces were a beautiful mix of roses, hydrangea, lilac, & viburnum... all displayed in a tall glass completely filled with submerged green hydrangea. The elegant ballroom was transformed into a bride's dream with detailed & individually tied napkin treatments with champagne satin ribbon, a seemless & perfect white dance floor, classic ivory linens, and elegant gold chairs. With all the efforts of the International Event Company with the staff of The Hidden Garden, the Bride & Groom and all their family & friends raved at how exquisite the wedding looked. Kristin & Dane didn't want the night to end! I'm sure you have noticed the gorgeous blooming rose bushes around your neighborhood. If you are lucky enough to have these wonderful blooms in your garden you can actually create some beautiful arrangements in your home. Garden roses, in general, are fragile and fragrant. Although these flowers don't last as long as most, they smell delicious. You need to take extra care in cutting these special blooms in your yard. Always cut the rose stems closer to the base of the stem of the plant. Cut the stem at an angle and immediately place in water. This will allow the flower to get a "fresh drink" of water and prolong the life of the bloom. Always remember to remove any foliage that would be below the water line. This will help prevent bacteria from accumulating in the vase. Remember to add water to the arrangement everyday. Just like we need air.....flowers need water! Some of my favorite Garden Rose varieties include Golden Celebration, Yves Piaget, Evelyn, White Mojaleka and Othello. To learn about all the beautiful varieties available check out this site - David Austin Roses. This past weekend the Hidden Garden designed an amazing wedding at Vibiana's in Downtown Los Angeles (at 2nd & Main). The location was once an old church that has been restored into an event facility (no longer a church) and it is gorgeous! There are so many beautiful details to the existing space that adorning the space with flowers and a few unique touches is really all you need to do!!! Our bride & groom (Gillian & Tim) chose an apple green, chocolate brown and a crisp white pallet for their decor. The Ceremony was held in the West end of the facility, cocktails in the outdoor garden and then reception in the East end of the facility. The table layout was a mix of long rectangular tables and square tables. Each table was adorned with a different combination of viburnum, dogwood blooms and wheat grass. Initially during the planning, Gillian had mentioned, do we have enough "flower arrangements" in the centerpieces. Normally, I would say, "there are never too many flowers!" but in this case i didn't want to take away from the simplicity of the design. It was amazing! Clean and crisp! Overall, Gillian and Tim were thrilled with the look and so were we. At this meeting, you should see the table linen options, chairs, candles, napkin treatment and of course the focal point - your centerpiece! Hopefully, you walk into this meeting and your florist nails it!! If that's not the case, not to worry, this is the opportunity to make sure that everything you envisioned for your special day is communicated to the floral designer. Talk to your florist about the changes you might want to make to the sample (color, quantity, flower selection, shape etc). This is the opportunity to really connect your vision with your florists talents and abilities. The ideal location for this meeting is at your floral designers studio. If changes need to be made (flowers, container etc) then they will have these resources readily available at their studio. Sometimes, brides ask to have this meeting at the actual hotel for their wedding so they can see the arrangement in the reception room. The reality is that one arrangement in a big ballroom isn't really going to give you the true visual of what your room will look like. The timing of this meeting is also important. You don't want to have this meeting further out than 2 months prior to your wedding date. This will ensure that the types of flowers you will have at your wedding will be in season (or close to it) for your sample centerpiece. You will see the actual arrangement rather than substitutions for flowers in the centerpiece. If you have this meeting to far out from your actual wedding date you might be apt to look at additional ideas and want to change your design again. In the end, you should walk away from the sample meeting knowing exactly what your table set up will look like for your special day. Not only will your florist feel confident when they set up on your wedding day but you will feel confident that they will provide you with the exact flowers and design that you had always envisioned. When setting a table for a wedding, baby shower or even a dinner party it's always important to think of the overall setting for your guests not just the actual centerpiece on the table. Although the centerpiece might be the focal point of your table, the other detailed accents will pull your look together. Napkin Treatments - The way in which you "treat" the napkin can help complete a look. Elements such as a menu, ribbon treatment, single floral bloom or piece of fruit are nice touches. Table Numbers - Don't just put a basic table number out there. Enclose the number in specialty frames or even name the tables rather than number them. Chargers - A base charger is always a beautiful finishing touch to any tabletop. It serves as a pretty display when guests first sit down as well as through their first 2 courses (generally) of the meal. It also sets the napkin apart from the linen. Votive Candles - When placing votive candles on the table consider something different than the traditional clear votive holder. You might cluster a group of colored votive glass holders or a few Moroccan tea cups (they come in great colors & patterns). If you only have clear glass votive then dress the glass with a beautiful ribbon treatment, leaf wrapping or floral detail. Think beyond just the centerpieces. Always remember the OVERALL appearance of the table is important....not just the individual details. It's how you put it all together that counts! I have lots of great pictures on The Hidden Garden website to give you some ideas and I am always an email away if you have questions or ideas to share! A handful of the best spring flowers have "woody stems". Blooms such as lilac, viburnum, hydrangea and blossom branches. These woody stems make it a little difficult for the water to penetrate the stem of the flower. The outer wood portion on the stem prohibits the water from completely getting into the inner stem of the flower. Without a sufficient amount of water these flowers will wilt quickly. The best way to ensure proper hydration for these "woody stemmed" flowers is proper processing. One of the best ways to break the wood stem of the flowers is to use a hammer to pound open the stem at the base. This will allow the "wood" portion to split and the water is capable of getting to the inner green portion of the stem. At the Hidden Garden, we process all of our lilac, viburnum, hydrangea and blossoms in this manner. It allows the flowers to get a "fresh drink" of water. In addition to this initial processing remember to add water daily to these flowers. They tend to drink water a little more quickly than others. Without a sufficient amount of water.....they just won't live! Read more about all my favorite spring flowers in the new issue of Inside Weddings, on sale now. It's that time of year again, the infamous Lilac season!!! Another great reason to love spring. Each April as I go down the escalator to the Los Angeles Flower market I love to see the buckets of lilac. Sometimes I can smell them before I see them. The lilac comes in deep rich purple tones, light lavender, white, purple with white variegated tips and a light lavender with white tips. In LA we receive our lilac locally from Acton the first couple weeks of the month and then it comes from Temecula for approximately 3 more weeks. Of course, Mother Nature plays a role in the length of time this flowers is available. The warmer it gets the shorter the season becomes for this precious flower. If you have an opportunity to purchase a bundle of this beautiful seasonal floral - hurry...it's almost done! An all white wedding can be such a traditional choice for floral decor. It's so romantic and expected. Why not try to put a twist on the "expected" and go modern with your design. There are many ways to make a traditional all white wedding palette a little different. 1. Group your flowers together by types in vases. For example do an abundant amount of one type of flower in a vase - in all white (or you could do this with any color really). All calas, all tulips, all lily of the valley. To make sure things stay modern you want to keep your groupings clean and simple but full and lush in order to make a statement. 2. Don't be to skimpy on the quantity of flowers when trying to appear modern. You run the risk of looking "cheap". For example, you might like the simplicity of a few white tulips in a vase. Rather than just 5 tulips in the vase, use 25 tulips in the vase! You'll make a better visual statement for your guests. 3. Submerge Single stems of flowers in water. When flowers are submerged in water they are magnified by the water/glass. This actually makes them appear to have larger blooms! Try it with a stem of cymbidiums. It is just beautiful! 4. Use a green toned linen as your base for your floral decor. 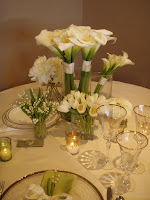 This color linen (a great celadon/apple color is my favorite) really makes the white flowers pop! This green tone is also a great compliment to the leaves of most white flowers. 5. Candlelight is always a great compliment to any color pallette - use as many as you are allowed (remember to check the fire permit rules for your area). Here at Hidden Garden we are always trying to create unique and sophisticated designs for our clients to enjoy during their special event! You can see a few sophisticated and colorful ideas in the spring issue of Inside Weddings. This past Sunday the Hidden Garden had the honor of designing floral arrangements for Jessica Alba's gorgeous baby shower. Her friends threw the shower at an adorable new tea house called Ever After Tea House in Studio City. It was the most charming location for a shower. I feel so fortunate to have been asked to design the floral decor for this special day for Jessica and baby. Most of the flowers were done in white, blush and lilac tones. Each of the guest table centerpieces were designed in custom hand painted boxes to spell out the word BABY. The florals inside the boxes were all shades of purple to lavender tones incorporating the use of Purple Lilac (which is in season just this month and smells delicious! ), purple anenomes, Sterling Roses, Purple Lisianthus and geranium. Showers are trending toward the spectacular lately, largely due to the fact that women are marrying and having children later than previous generations. The Hidden Garden is designing "events" with eye-catching decor now, perhaps because budgets also increase with age. I am all for it, I love to design an entire shower theme, such as Jessica's, that welcomes friends and family as they enter and flows throughout the event to tables to garden and beyond. A baby shower is a celebration of life, so why not celebrate by incorporating natures special gift...flowers. My favorite month of the year for flowers....April!!! If you have never taken a trip down to the Los Angeles Flower Market now is the time of year. It is overflowing with amazing spring flowers such as local lilac, viburnum, anenomes, ranunculus. tulips, iris, callas - the list goes on! It is just a beautiful time to incorporate flowers into your life. Whether you are picking up a full bunch of lilac or a small clutch of anenomes, now is the time to bring these precious spring flowers into your home. Their colors and scents will be sure to brighten any home environment. For Wedding ideas, pick up the new issue of Inside Weddings and read my latest article all about Spring Wedding Flowers! Head to the newsstands.....the Inside Weddings Spring 2008 issue is out! We are fortunate enough to be included, again, in this fantastic magazine. I have been a fan of this wedding publication for years and once you read an issue you will be too. Hidden Garden is featured for an Ojai Valley Inn Ceremony and Reception. Melissa and Eric celebrated a June 16th wedding at this amazing property. One of my favorite ceremony locations in Ojai is the view of the golf course. When you pick up the magazine you'll see why it's a must have location site! And I am also honored to be a contributing editor to Inside Weddings as the Floral expert - this issue it's all about Spring Flowers! Take a moment to pick up the new issue of Inside Weddings - you won't be disappointed!